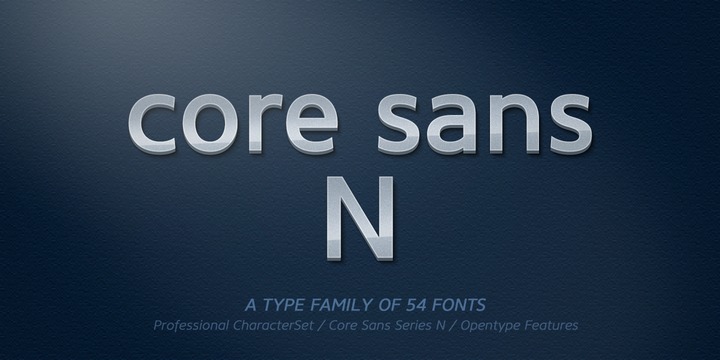 The Core Sans N Family is an integral part of the Core Sans Series. Letters included in the Core Sans N Family are beautifully designed using authentic neo-grotesque as well as neutral shapes sans ornamental commotion. The spaces allowed between individual letter forms are specifically accustomed to generate an impeccable typesetting. The typeface comprises of about 3 widths including Condensed, Normal, and Extended. It also comes in 9 different weights, namely; ExtraLight, Thin, Regular, Light, Bold, Medium, ExtraBold, Heavy, Black, and Italics for each format. The unique typeface is highly recommended for use in various books, screen displays, web pages, and a lot more.